With Craig Bannecke bringing up the concept of carrying a pocket knife last week, I began to think back on knives in my life before the two Swiss Army knives I wrote about. In one of those famous senior moments, my train of thought got sidetracked and took me on a very roundabout way to get to the subject I planned to write about. Here is the result of that senior detour. Some of my earliest memories of pocket knives go back to the days before I ever owned one. Those memories take me back to Saturday mornings at the Madison County Courthouse in downtown Huntsville. Living only a few blocks from town, it was an easy walk for me from my house on East Clinton Street to courthouse square, a trek I made almost every Saturday in my pre-teen days. 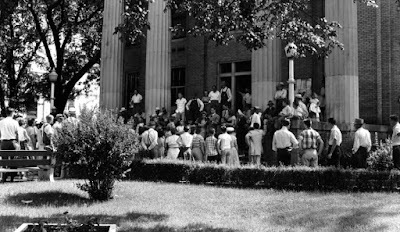 The courthouse steps were a fury of activities on Saturday mornings in the Fifties. The steps themselves had a strange fascination for my inquisitive mind. 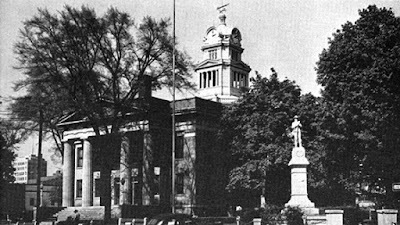 I did not know when the courthouse was built, but I knew it was old (now know it was 1914). One of the things I found most intriguing was the way the granite steps had been worn down over the years by the thousands of times the steps had been climbed. There were obvious depressions into the solid rock from the years of wear. The concept of erosion of such magnitude was overwhelming. One side of the courthouse’s set of worn steps might be occupied by a young want-to-be celebrity banging away on his guitar and singing with all his soul. Those folks always seem to have an audience, no matter how good or bad they were. Nasal twanging county songs were a favourite genre. I know of none of them ever making it in the big time, but that did not deter them from trying and perhaps their own efforts encouraged others to do likewise. In the days when playing acoustic was the norm, amps were not needed to allow the tunes to echo off the canyon walls of the brick buildings making up courthouse square. Even before you entered the square’s domain, if the wind was right, sometimes you could hear the music from the side streets. One of the arsenal workers who rented a room from my family brought his guitar with him when he came down from the North for work. To him the courthouse steps were as prestigious as the Grand Ole’ Opry and he was amazed he could just take his guitar downtown on Saturday mornings and collect an audience as he played his repertoire of three-cord songs. Another side’s steps hosted the revivalist gloom-and-doom preacher banging on his Bible as he waived it over his head and periodically pointing it at one of the sinners in his make-shift church of marble steps and a tree-canopied sanctuary. The singing of old-time gospel songs would often compete with the country and western music from the adjoining side. Members of his flock wandered in and out for short periods of time, usually departing when they realized they were the sinners to which the message was damning. Hecklers were not uncommon and the self-appointed preachers seemed to relish the opportunities to debate between Heaven and Hell in the war initiated by the army of Satan worshipers. In my recollections they were always preaching the repent or go straight to Hell sermons which were punctuated by various renditions of “Hallelujahs” and “amens” from the Bible Belt audiences. I am not sure if the third side hosted a regular fare or not, except during election season when candidates took the platform to share with their followers the political promises that would be implemented upon their election. As noted, this was not a year-round venue, but many candidates seemed to enjoy the opportunity to take their message to the people in this down-to-earth-pressing-the-flesh setting. And what was a better way to get a free audience for their soapbox promises than the steps of a centrally located public building? Finally let’s walk around to the fourth side of the courthouse which was the home of the group of men who are responsible for this recollection. 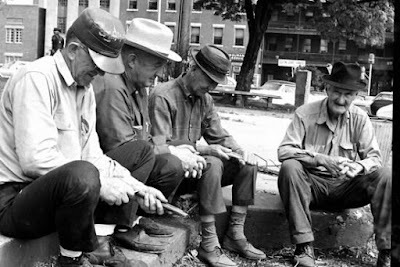 Without exception, one set of courthouse steps was the Saturday morning domicile of a group of old men usually wearing overalls and chewing tobacco while they turned good pieces of cedar into worthless shavings. Now I never took shop at Lee, but in a weak moment I was convinced I needed to purchase a Shopsmith multi-tool when I saw one being demonstrated by an expert salesman in a mall in Omaha. One of my paramount memories of learning to use the lathe function was how great a job it did turning good wood into shavings. The men on the steps would be a great matchup with my Shopsmith in destroying wood. I believe the proud Confederate soldier atop the commemorative statue smiled down upon this vintage group of Southern culture. They always seemed to have a topic of conversation and you could not miss the sweet smell of the red cedar strips as the robotic motions of the men made long pushing sweeps of their extremely sharp pocket knives away from their bodies. The knives in my memory were all bone handled but I never wondered about or knew the brand name of the instruments creating the giant piles of cedar shavings on the steps. Rarely was anyone actually carving any type of real art form but instead were just enjoying the company, talk, and the tranquil motions of “whittling.” To me there has always been a definite distinction between the act of “whittling” and “carving.” I always looked upon carving as a way of creating a recognizable object from a piece of wood. I once heard the way to carve a horse was to start with a block of wood and remove any of it that doesn’t look like a horse. Whittling is different in my opinion. Looking up the definition of that word I found: “to whittle wood or the like with a knife, as in shaping something or as a mere aimless diversion.” In my mind, the men on the courthouse steps in the Fifties were examples of the latter definition, adrift in aimless diversion. 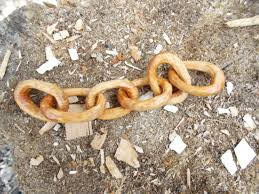 The only real piece of any type of actual carving I can recall is the odd times when one of the craftsmen of the group would carve a long interlinked chain from a single piece of wood. To my recollection I never remember anyone carving animal figures or any other recognizable item while sitting on the steps of the Madison County Courthouse on a Saturday morning. In fear of repeating myself, they just whittled pieces of wood into long pointed sticks enjoying the soothing motion and rhythm of their strokes for its own sake. And with those reflections, I suppose my essay on my personal experiences with knives will have to be put off until a later issue. Memphis, TN - Sue and I just returned from a relaxing week's vacation at Myrtle Beach. We didn't do much but spend the days looking for shark teeth and I was able to get in two rounds of golf. We stayed in a beachfront condo I was able to rent through the Armed Forces Vacation Club. Last week I asked for some input on what I called the Diversified Education (DE) program, and thankfully several of you came through with some information. It turned out it was not DE, but was Diversified Occupation in some memories. There was a DO club with a photo in the 1964 Silver Sabre, but all it had was the photo and names of the members of the group with absolutely no explanation of the purpose of the organization. Here are some of the responses I received. Joel Weinbaum, LHS '64, wrote: "I don’t have any recollection of the DE program at Lee but back in Sheffield at an earlier age and hearing the grapevine of who was doing what as they approached graduating HS, that program was called Diversified Occupation,or “DO.” And those students worked part-time jobs for brief periods in the community to get a “look- see.” And may have taken class time for that effort. Otherwise kids wondered off to the military or college." Tom Gilbert, LHS '67: "I was in DE, we would get out of school at noon and go to our job. There was also a daily class. I worked in the shoe department at J.C. Penney at the mall. For each report card I would take a form to Mr. Zlosl my boss and he would fill out and send back in an envelope. It was part of the grade for DE including class work. I was paid by Penney’s. I was nominated to be DE student to represent Lee in Birmingham . I received third place in state of Alabama. I was ahead in points until the final interview when asked my goal and I replied store manager. After the competition I was told goal wasn’t high enough should have said CEO of Sears. I do remember hair dressing etc. being in a program also auto mechanics but believe that was DO." 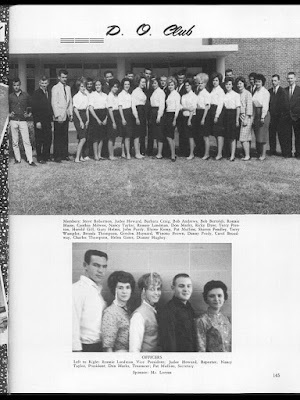 Dianne Hughey McClure, LHS '64: "I was in the program. I worked for Dr. Grady Baker. My interest in nursing started here. I worked from 1-5 every day and every so often on Saturday. Pat Mullins Hargrove was in the cosmetology program By the time we graduated she had her licence and eventually her own shop. Yes, I did get a pay check for my work for Dr Baker. I think it is a good program to get a chance to explore your interest." Like Craig, I grew up when / where guns and knives were used for sport and food. I always had a small pen knife for utilitarian reasons. Today, I carry a small Swiss Army Knife that I find useful many times each day. My most memorable connection of a knife comes from when I was in the Army. I served two tours in Vietnam, and in addition to an M16 and .45 cal pistol, I had a K-BAR knife. The only problem was that I had no way to sharpen it. 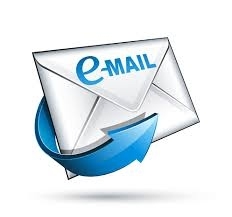 I wrote to my father and asked him to send me something. A few weeks later I received a package containing a whetstone and a small container of oil. He knew just what I needed, and I had no problem keeping the knife sharp after that. You made my day. I gave up a very special Swiss Army knife years back. At the time I was turning 12 my oldest brother stationed with the US Army in Iceland sent me one of the all equipped knives, not the great big one, maybe an inch wide, for the occasion. Nobody at the time had ever heard of a Swiss Army Knife. I made a scabbard from an Army boot top to wear on my belt. Had it through Scouting, carried it to Vietnam and all the far eastern travels. Loved that knife. Someone else is enjoying it now. I was on a two week AcDuTra (active duty for training) at the Philadelphia Naval Station pier side aboard the USS Ellison, a tin can being readied for transfer to the Pakistani Navy. At the end of the two week period, it was great to be heading home. There were a large number of reservist being rotated in to work on that ship. We were let go a few hours early because of others coming in. We found a flight out to match. Went down to my bunk, changed to my civilian clothes for travel home, put my dungaree pants off to the side with my knife on the belt. Finished packing my seabag and someone hollered to hurry up for our ride to the airport. Those dungarees stayed where they lay…with my cherished Swiss Army Knife. If you ever run across it, the scabbard is black shoe top leather with some grommets visible laced together with waxed flax string and on the side cut into the leather is a “range finder,” the Navy symbol for Fire Controlman. I called back to the ship after getting home. Wasn’t much they could do by then. Its still in the world. Glad to be good for something. They say “if you can’t be good for something, at least be good for nothing!" I was happy to see you were able to use the article on the pocket knife I sent you. Enjoyed reading it again. I first sent it to Skip Cook, Don Stroud and John Drummond thinking they would enjoy the article. Don commented back to me that his Dad always carried a pocket knife and if you knew Mr Stroud, he was a lot like the men the article described. Skip, said he had one but has had it so long that he is afraid to carry it now, for fear he might lose it. I get that ! John, said he occasionally had carried a pocket knife but got tired of giving them up at the airport. You don't often get those back ! My son Zack sent me this article as he knows Dad always carry's a pocket knife. And I have raised him to be a pocket knife carrier as well. Case pocket knives have always been my favorite and having grown up in North Alabama and identifying with many of the writers comments I especially enjoyed the article. My earliest memories as a kid growing up in Huntsville was saving up my grass mowing money and allowance so that when I had enough I could go buy a Case pocket knife. My favorite place to make that purchase was the old Army - Navy Surplus Store on the Southside of the square downtown. My problem was I kept losing them. Running up and down Pinhook Creek, cutting cane poles to fish with, fishing line, digging worms and playing in the woods and fields around Lakewood took its toll on my knives. Wish I had half those knives I'd bought back then and lost. They'd be worth something today along with the memories they would bring back. I've attached a photo of my current Pocket Knife inventory that I carry; all being Trapper two bladed models. One being a Schrade I bought 33 years ago in Kentucky with some of the winnings from a Bass Tournament I'd won. The other three are Case knives. I have one single blade Trapper model that I bought to carry specifically for Church. It is long and narrow and not bulky in my dress pants as the others would be. Again, glad you were able to use the article and hope it brought back fond memories for other Lee High Alumni as it did for me.